Village of East Davenport | River Action, Inc.
to protect and restore our greatest asset – the Mississippi River – and our shared RiverWay environment. the cultural and economic activities that enhance and promote our community and quality of life. 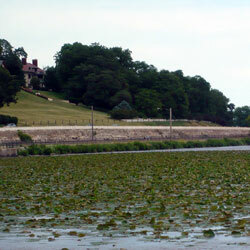 adoption of sustainable practices that improve our waterways and our area's environment. Improving the quality of life in the region must start with an appreciation and understanding of the vital role played by the Mississippi River. We seek to help build a sustainable future through awareness, education and stewardship of the Mississippi River and our shared RiverWay. Creating a vibrant, engaged community leads to greater support for initiatives to preserve, protect and enhance our environment. You can volunteer in a variety of ways for a wide range of River Action programs, events and activities. We are a non-profit charitable 501(c)3 organization so your contributions are deductible to the extent allowed by law. By becoming a member, you can receive our quarterly newsletter and special discounts on our events and activities. Welcome to RiverWay – the Quad Cities’ scenic stretch of the Mississippi River with almost 100 miles of area parks, trails and overlooks between the river bluffs. 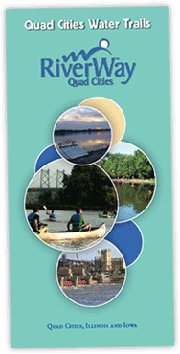 Enjoy America’s most famous river by walking or biking along its paved riverfront trails. Experience the Mississippi River as it was first discovered, while paddling! The Quad Cities area is rich with water. Paddling conditions on the Mississippi and Rock Rivers are perfect for multi-day excursions with camping access, afternoon urban getaways, and getting in touch with nature for all levels of paddlers. The 45 miles of Quad Cities Water Trails also tie directly into 73 miles of recreational trails for exceptional cycling and hiking. 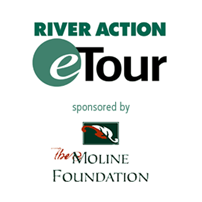 River Action's E-Tour brings new technology to the riverfront and creates opportunities to engage new audiences. QR Codes and web addresses have replaced the phone numbers from River Action’s Audio Tour. Just how old is this limestone bedrock? CLICK HERE to find out how old this white limestone bedrock is? From the path here, one can see two prominent outcrops of limestone bedrock. One of these runs parallel to the railroad tracks, and the other lies just north of River Drive. Read more about Just how old is this limestone bedrock?